Photo credit: Utah State University. For her work in preventing wildlife-vehicle collisions, ecologist Patricia Cramer received the Denver Zoo's 2010 Conservation Award. She’s among exhibitors at USU and Swaner Preserve and EcoCenter’s Sept. 4 'Back in the Saddle’ event in Park City. Photo credit: P. Cramer, USU, UDWR, UDOT. One of Cramer's remote cameras captured this mountain lion using a tunnel under Interstate 70 near Fish Lake National Forest in central Utah. 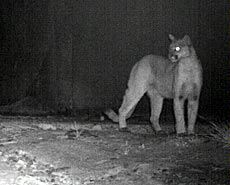 It’s the first known evidence of a cougar using a culvert crossing in Utah. After more than a decade of studying and advocating ways to prevent collisions between wildlife and vehicles, Patricia Cramer sees the tide turning. 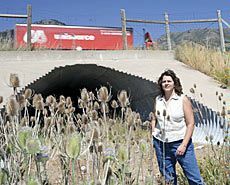 The Utah State University researcher is pleased by recent communications from state and federal highway departments asking her for input on how and where to implement wildlife crossings as they plan new projects. In recognition of her efforts, Cramer was selected for the Denver Zoo’s 2010 Conservation Award. She’ll formally receive the award and its accompanying $5,000 prize in an Oct. 14 ceremony. Among her current projects, Cramer is working with the Utah Department of Transportation and the Utah Division of Wildlife Resources to monitor wildlife crossing behavior at sites throughout Utah, including Interstate 80, a busy travel corridor for commuters, tourists and freight between Salt Lake City and Park City, Utah. With assistance from Wildlife Protection Society founders and Park City residents Jackie and Tim Fehr, along with UDOT and UDWR personnel, Cramer installed cameras under bridges and overpasses at points on I-80 with high vehicle-animal collision rates. During the previous year, portions of paved areas under these bridges were naturalized to encourage wildlife to use them. Using remote trail cameras at these locations and recording the number of animals killed on the road, Cramer and her team are helping UDOT determine if additional measures are needed to make the improvements more effective. According to the National Highway Traffic Safety Administration, about 200 Americans die in animal-vehicle accidents each year. In a recent study, the Centers for Disease Control found that one quarter of all animal-vehicle collisions result in human injury. The animals fare even worse. Mangled carcasses of deer and other wildlife are a frequent sight along Utah highways. Cramer is still haunted by the grisly image of a moose crushed by a vehicle on I-80 in 2008, as the animal attempted to return to its winter feeding grounds. Cramer is among several USU researchers who will present their work at Utah State and Swaner Preserve and EcoCenter’s Sept. 4 “Back in the Saddle” equestrian-orchestral performance fundraiser at Park City’s Gray Barron Ranch. The event’s featured exhibits also include a water quality monitoring and watershed education project led by Nancy Mesner, Natural Resources Extension leader and associate dean in USU’s College of Natural Resources, along with a natural resources interpretive project Mark Brunson, professor and head of USU’s Department of Environment and Society, is coordinating for the Swaner preserve.